If you've marveled over the intricate beauty of the idols of Goddess Durga during the Durga Puja festival in Kolkata, you've no doubt wondered how they're made. 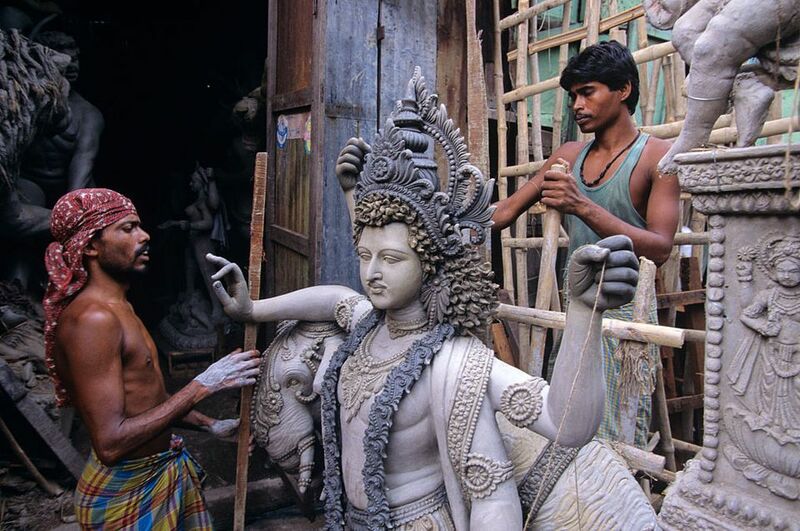 It's actually possible to see the idols being handcrafted. Where? Kumartuli Potter's Town in north Kolkata. The settlement of Kumartuli, meaning "potter locality" (Kumar = potter. Tuli = locality), is over 300 years old. It was formed by a bunch of potters who came to the area in search of a better livelihood. Nowadays, around 150 families live there, earning a living by sculpting idols for the various festivals. In the lead up to Durga Puja, thousands of artisans (many who are hired from other areas) toil diligently in approximately 550 workshops to complete the idols of Durga in time for the festival. What's pleasing to note is that the idols are made out of environmentally friendly materials such as bamboo and clay. This differs from the idols of Lord Ganesh, which are predominantly made out of Plaster of Paris for the Ganesh Chaturthi festival, particularly in Mumbai. The majority of Durga idols are crafted by lesser known artisans, who are experimental in nature. However, there are a few renowned names that make traditional idols that inspire deep devotion. One such person is Ramesh Chandra Pal, who works out of his studio at Raja Nabakrishna Street. There's always a rush to see his idols during Durga Puja. The Durga idols are displayed on lavishly decorated public podiums all over Kolkata during the festival. If you love art, you shouldn't miss visiting Kumartuli. But regardless, it's a place that offers a unique dose of culture. The narrow maze of lanes and alleyways team with humanity, and gods and goddesses in various states of creation. Wandering through them, and seeing the artists at work, reveals a fascinating world within a world right in front of you. One thing to keep in mind though, is that the area can be a bit dirty and unkempt -- but don't let it put you off it! North Kolkata. The main location is Banamali Sarkar Street. It's easiest to take a taxi (travel time is around 30 minutes from Park Street) to Kumartuli. Uber is available in Kolkata, and the fare will be approximately 140-200 rupees one way. Otherwise, buses and trains go to Kumartuli. The nearest railway station is the Sovabazar Metro. Sovabazar Launch Ghat (alongside the Ganges river) is also close by. Taking a walk to the riverbank is worthwhile, as you'll get to see old Gothic & Victorian style mansions. From there you can get a boat back to central Kolkata. Prefer to go on a guided tour? Check out this special The Goddess Beckons tour offered by Calcutta Photo Tours, and also this Bringing the Goddess to Earth walking tour by Calcutta Walks. Expect to pay 2,000 rupees per person for adults, excluding transport. Idol-making for various festivals happens mostly from June to January. Of course, the biggest occasion is Durga Puja. There's usually a frenzy of activity around 20 days before the Durga Puja festival begins, in order to get all the work finished. Traditionally, the eyes of the Goddess are drawn on (in an auspicious ritual called Chokkhu Daan) on Mahalaya -- around a week before Durga Puja starts. It's worth seeing. In 2018, it falls on October 8.